The heart of a King is a good and noble heart. The heart of a king is filled with and overflows with the qualities of goodness and nobility. Goodness is, well, goodness. It is everything that is good in the sight of God the Father. Nobility speaks of high character and excellence; having the rank and lineage of the ruling class within you. Therefore, if we have the heart of a King we have a heart filled with good thoughts and motives, grounded in strength of character and integrity, carrying confidence of Father’s authority, and ruling with excellence in our sphere of influence. Wow! Makes you want to have the heart of a king; the reflection of the King of Kings, Jesus Christ. Jesus said that those who believed in Him would have His ‘kingdom within them’. (Luke 17:20, 21) The good and noble heart condition begins with establishing His kingdom within you. In Luke 8 Jesus ministered truth through the parable of the sower. In verse 15 He gives us 4 steps to creating the heart of a king; ‘But the seed on good soil stands for those with a good and noble heart, who hear the word, retain it, and by persevering produce a crop’. First, we must hear the Word of God. He’s not talking about physical hearing so much as hearing with your spiritual ears. This is a deeper place of really HEARING and perceiving what the Father is saying through His written Word, the prophetic word, Godly counsel from leaders and ministers, teaching of the Word, and direct words from the Holy Spirit. A noble heart hears and perceives the Father! 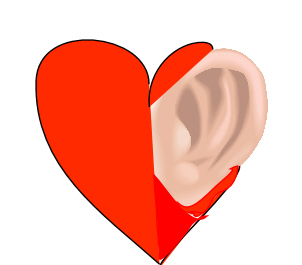 Hearing with the heart is an active, not passive, activity. Three times in the New Testament Isaiah 6:9 and 10 is quoted ‘you will be ever hearing but never understanding; you will be ever seeing but never perceiving. For this people’s heart has become calloused; they hardly hear with their ears, and they have closed their eyes. Otherwise they might see with their eyes, hear with their ears, understand with their hearts and turn, and I would heal them.’ This scripture reminds us that we must truly hear and perceive at a deeper level in our heart to understand. The Word of God is NOT background noise! It is not frivolous words to be mixed with all the flood of digital information pouring into our minds from laptops, video streaming, ipods, email, cellphones, etc. It is not truly heard and perceived unless it is deliberately pondered and considered in your heart. You must mull it over! If you truly desire to have the heart of a King, open your heart to hearing and perceiving at a deeper level. Listen to and ponder intently what the Holy Spirit is saying via the written word. Consider carefully the prophetic word spoken to you. Meditate on teaching that challenges you to a deeper level. Take in small doses of scripture, but study the depth and breadth of meaning. As you hear and perceive the Word will take root in the soil of your heart. I’ll continue with the next steps to a good and noble heart in the next post.